Building on our overview of how Wine Scholar Guild programs can complement and be articulated with other, more general wine study programs, we would like to propose a deeper look at our understanding of how Society of Wine Educators (SWE) and Wine Scholar Guild programs can complement each other. 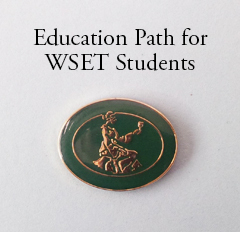 The Society of Wine Educators is an US-based organization founded in 1974. Its mission is “to advance wine education through professional development and certification”. Since its inception, the Society of Wine Educators has gained tremendous momentum and recognition. Their CSW is a strong general wine study program that has notably been made by certain renowned producers and wholesalers a mandatory accomplishment for their staff. Attaining their Certified Wine Educator title is a true accomplishment only attained by a few hundred individuals around the world. It validates a deep general wine knowledge as well as one’s ability to teach wine. SWE organizes an annual conference that changes location each year. It is a must-attend event for all serious students of wine. The Certified Specialist of Wine (CSW) exam tests a candidate's wine knowledge and mastery of key elements within the worlds of viticulture and wine production. Specific topics tested include: physiology of taste, wine composition and chemistry, faults, viticulture and enology, labels, laws & wine regions, the US wine industry, wine's contribution to health, wine etiquette & service, food & wine pairing, and responsible beverage alcohol service. The certification is supported by a study guide, webinars, online classes, and other online tools. Some wine schools also offer preparation classes. The SWE also offers a Certified Specialist in Spirits certification. The Certified Wine Educator (CWE) tests not only a candidate's wine knowledge, but also tasting and teaching abilities. The exam includes a theory exam, two blind tasting exams and a presentation skills demonstration. Candidates pursuing the CWE certification must already possess the CSW certification. The CWE is a self-study educational program. The SWE also offers a Certified Spirits Educator certification. 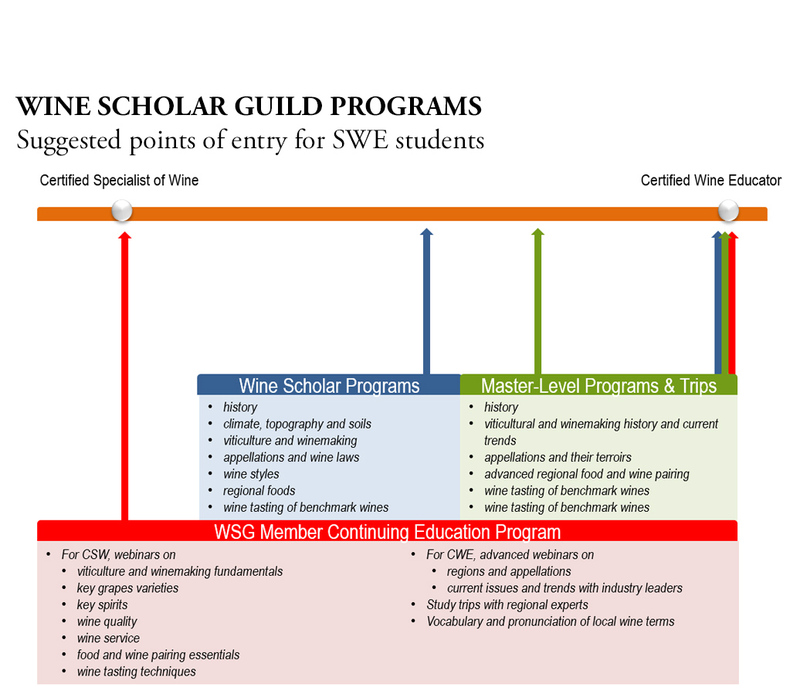 How Wine Scholar Guild and SWE programs can complement each other? All information necessary to pass the CSW exam is contained in the CSW manual. Classes are offered in a few selected locations and SWE regularly offers preparatory webinars to their CSW candidates. This being said, repetition and deepening can help students of general wine study program such as CSW to integrate and absorb the large amount of information required for them to master. WSG member webinars cover the fundamentals of viticulture, winemaking, grape varieties, wine tasting, wine service and regional studies. These valuable resources can help students preparing for more general wine study programs such as the CSW exam. CSW certification will give wine students a strong foundation to enter our Wine Scholar and Master-Level programs from a position of strength. 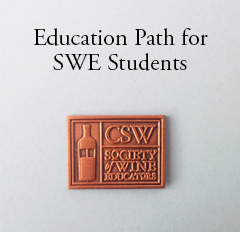 While not a pre-requisite, we encourage students to follow a program such as the SWE’s CSW before entering our Wine Scholar Programs and Master-Level programs. If you have passed the CSW, but are not ready to proceed with the CWE yet, our country-specific Wine Scholar Programs can be an excellent way to specialize and continue learning. They offer a deeper dive into France, Italy and Spain. With WSG programming, each country’s foundation unit puts that country’s history, wine laws, grape varieties, viticulture, and winemaking practices into perspective before covering each of the individual wine regions with respect to regional history, climate, topography and soils, appellations, wine styles, and regional food and wine pairings. Optional, in-class tastings provide the opportunity to build familiarity with key wine styles. If you want to challenge yourself further, WSG Master-Level programs give the opportunity to independently study one of the classic wine regions of the world like Bordeaux, Burgundy and Champagne – perhaps one that has always fascinated or confused you? Membership in the WSG provides access to our ongoing series of webinars, always led by industry experts and covering a range of topics that will help keep you current and engaged. Candidates for the Certified Wine Educator program need to acquire a profound and deep knowledge of most aspects of the world of wine. As preparation for this title is mostly done through self-study, we believe that our programs can be of great resource for CWE candidates. The Wine Scholar Programs provide essential information about France, Italy and Spain. Information that is critical to the study of wine at this advanced level. The WSG Master-Level programs build on the Wine Scholar Programs and allow you to master the complexity of specific regions. The programs cover appellations, climate, geology, grape varieties, wine law, regional cuisine and trends. 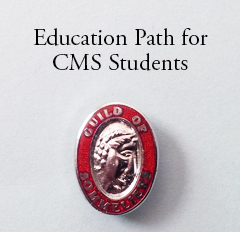 This is important information for advanced students such as those aiming to become a CWE. Membership in the Wine Scholar Guild allows access to wine education videos with leading industry experts. These provide unique opportunities to gain insight into current wine trends and issues and represent an essential tool to building the knowledge expected at this advanced level. WSG study trips are led by regional experts and allow you to “get up close and personal” with all the important wine regions. These are unparalleled opportunities to really master and understand the complexities of a region. NOTE: We have tried to describe SWE programs to the best of our knowledge and research and to explain how our programs complement them. These statements reflect our own opinion and do not reflect the opinion or endorsement of the SWE. We welcome all comments and suggestions on this article.